There’s been a lot of talk about HTTPS and if you should move your site over to it. In our opinion, yes, you should. The advantages at this point outweigh the process of getting it done. If you don’t want to read the technical mumbo-jumbo, skip straight to the “What is the SEO advantage of HTTPS?” section. HTTPS stands for Hypertext Transfer Protocol (Secure). Hypertext Transfer Protocol is essentially how a website will talk to your browser, such as Chrome or Firefox. If you look where you enter a URL in your browser, you may see http://www.yourwebsite.com in front of the address. With HTTPS, it’s https://www.yourwebsite.com. 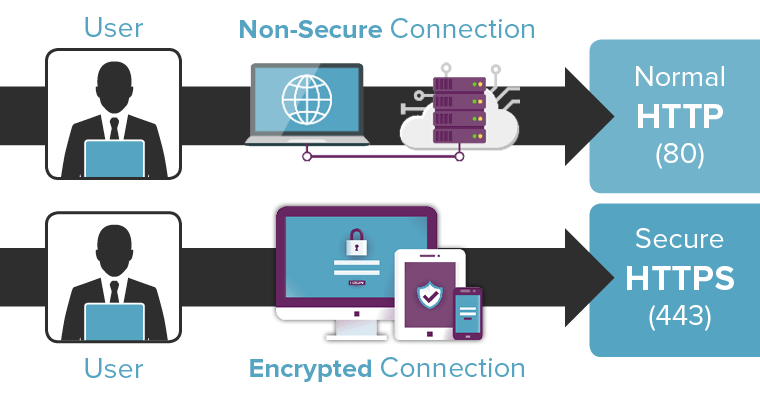 With the secure version of HTTP, the website and your browser form a secure encrypted connection using an SSL certificate. SSL stands for Secure Sockets Layer. SSL is the protocol being used to encrypt the connection. When you visit a site using HTTPS, the web page will send its SSL certificate to your browser. Your browser and the website initiate an SSL handshake that establishes the encrypted connection. A standard HTTP connection is visible in plain text and can be read by anyone who breaks into the connection between your browser and a website. You’ve probably used HTTPS more times than you realize. Almost any purchase you make online has been over an HTTPS connection, since you don’t want your credit card stolen. What is the SEO Advantage of HTTPS? Google has been pushing sites to move to HTTPS for a while now. The main reason they give is for security. The more secure the web, the easier it is for Google to trust sites and give better search results. To accomplish this goal, Google began using HTTPS as a ranking signal. In 2014, Google announced their plan on how this would work. Over time, Google has been adding power to that ranking signal. Starting in January, Chrome, Google’s own browser, will be putting “Not Secure” on any site not using HTTPS, which is another clue of the importance Google is putting on making the switch. Users might not trust a site that has a big red flag such as “Not Secure” when they navigate to your site. Moz, a leading source for current SEO information, ran some numbers this summer and found that 30% of page one results were using the HTTPS protocol. This has been going up ever since Google made the announcement. Moz projects another ranking boost for adopters of HTTPS protocol this year. The process of switching over to HTTPS used to be a bit scary. Any major domain shift could cause unforeseen errors and end up with a mountain of redirecting. Those days are done, however. With Google pressuring companies to move to HTTPS, the process and technology have been made easier to use. We’ve performed multiple transitions smoothly and with great success. If you’re ready to make the jump to a secure site, we can help you out. With Google encouraging it and giving a ranking boost for implementing it, you’ll have a leg up on your competition who may not be using it yet. Being ahead of the curve is always a good thing! Don’t be afraid to take the jump. We’ll walk you through the process and make sure your move to HTTPS is error-free. Contact us today to make the move!